Clarissa doesn't explain it all: Goals make me crazy!!! Literally! 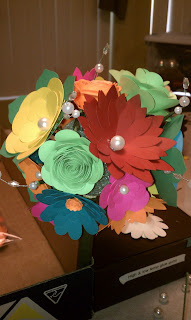 Here is a picture of a finished bouquet!!! Thanks Amy for giving me this picture!!!! Doesn't it look awesome?! Good Evening! What a wonderful day!!! I love technology and was fortunate enough to watch the Women's Gymnastics this morning while eating breakfast. It was a great competition and a well deserved win for "The Fab 5". My favorite part was calling my husband's cell phones (yes, he has 2! ), his work phone, texting to spoil the surprise. I did this because he decided to tell me the night before all of the results before I sat down to watch the evening broadcast. We have this weird relationship where we try to "out do" each other. It probably isn't healthy but I know we both enjoy having a little fun. LOL! I looked at my pictures and really haven't taken much in the past week. I need to get out and do stuff! I have decided to take on near impossible tasks to do but I am determined to make my life as complicated as possible. I have been wanting chair pockets for my classroom chairs but when researching for prices and quality, it would be over $200. I spend that money on necessary classroom materials such as glue sticks, notebooks, and manipulatives. I put that off for a year but still had that "want" on my list so I decided to play around on Pinterest. I looked up chair pockets and up pops different types of chair pockets to make. I figure I could make them for 50% less. Sure it takes time and buying materials, but I see it as a goal to reach by December. The best part is that I am not limited to certain color fabric so I could match it to my theme which is "black and white". This is very exciting and scary since I am not the best at using a sewing machine. By working on these I should be a pro by the time I finish all of the chair pockets. The other goal I have set for myself is to make quarterly writing and reading journals so I have a better record for parents so they can see the throughout the year. I may need to recruit help throughout my processes (aka, Tricia, Karen, Amy, Andrea)...LOL!!! I thank anyone else in advanced that I con into helping my craziness. All the while, I am a full time Kindergarten teacher and graduate student. I should have plenty of time! Yeah! Right!! Well this crazy crafty lady needs rest. School starts in 8 days. I don't think I am ready but I am sure it will be ok when the first day comes...Thanks for reading! Goodnight!